In 2006, ATEÏS has made its first audio over IP project for train stations in Paris. 5 years of experience later we have developed a totally new range based on the most advanced standard. Why IP Nowadays, almost all the buildings are equipped with a network infrastructure. The audio over IP technology has the huge advantaged to be able to use this existing network and to cross easily routers and even use the internet. Where to use it You would be suprised if you knew where we have already installed Audio over IP solutions. From the standard applications like shopping malls, hotels, museums, theme parks, hospitals, schools to more tricky and original applications... IP networks are everywhere. Benefits With TERRACOM, you will have a price competitive solution to answers to a lot of applications. By using the standard network and the POE technology you will simplify the installation and the network topology. Because it is IP based, the monitoring and the maintenance are simplified. These small TERRACOM devices have a powerful processor, linux based. You will find a remarkable list of features like priority management, backup management, event management, scheduler, local channel and volume control, paging, echo cancellation, noise reduction. ATEÏS has made the choice of no compromise. Instead of non professional cinch connector, the TERRACOM have balanced audio on terminal blocks adapted to the Audio Pro market. TERRACOM offers the possibility to stream using the standard RTP protocol in unicast, multicast or broadcast. 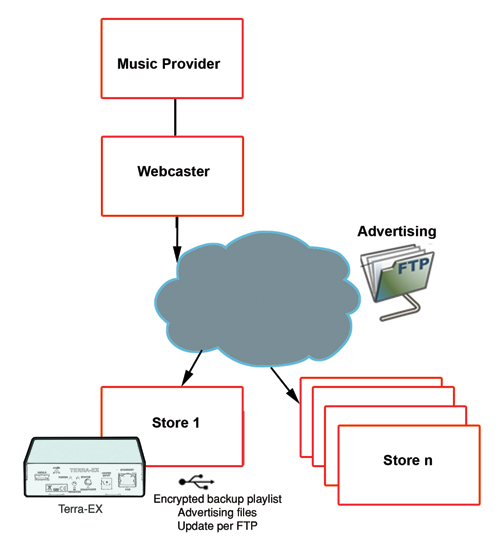 For some applications, like the Instore, the TERRACOM can stream using shoutcast/ icecast protocols. All Terracom devices support the POE, Power Over Ethernet. With POE, the constraint of having AC power outlets is eliminated. This provides flexibility in placing TERRACOM devices in the most optimal locations instead of choosing locations where power is available. Optimal placement leads to more efficient network designs and better application performance. And if one day you want to change the location of your Terracom, it would be easier. The network installation can be accomplished easier, faster and for less cost. It is also safer because you can centralize the power management and protect it with an uninterruptible power supply (UPS). And finally with a manageable PoE LAN switch via a web browser or by SNMP, remote networking devices can be easily reset or shut down saving the time and expense of dispatching a technician. Terracom embeds a web server that enables you to control the Terracom through your favorite internet browser. For bigger system, you can use the SNMP protocol. 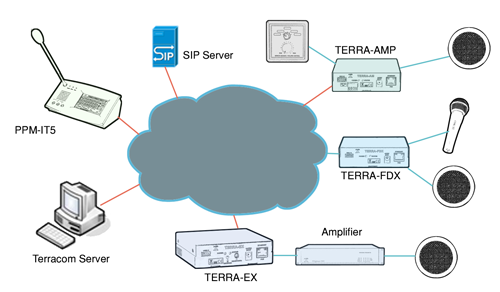 For more complex system, the TERRA-SERVER will be your supervisor and the management solution of your installation. RTP = Real-time Transport Protocol is a standard packet format for delivering audio over IP networks. RTP supports data transfer to multiple destinations through multicast. SIP = Session Initiation Protocol is a standard protocol to initiate a communication. It is often used by the IP telephone. POE = Power Over Ethernet technology describes a system to pass electrical power safely, along with data, on Ethernet cabling. SNMP = Simple Network Management Protocol is a standard protocol for managing devices on IP networks. LAN = A Local Area Network is a computer network in a limited geographical area. There areusually no router in such a network. PBX = A private branch exchange (PBX) is a telephone exchange that serves a particular office. DTMF = Dual-tone multi-frequency signaling is used for telephone signaling. DTMF assignsa specific frequency (consisting of two separate tones) to each key so that it can easily be identified. NTP = The Network Time Protocol is a protocol for synchronizing the clock of devices over a network. IGMP = The Internet Group Management Protocol is a communications protocol used to establish multicast group memberships. VLAN =A virtual local area network has the same attributes as a physical local area network (LAN), but it allows for end stations to be grouped together even if they are not located on the same network switch. SPI = Serial Peripheral Interface Bus. The live announcements are done with dedicated IP console (PPM-IT5), or microphones plugged on TERRA-IEX or TERRA-AMP or TERRA-FDX. The selection of the destination of the announcement is done directly on the PPM-IT5 touch screen or on a PC with a TERRA-SERVER client application. The background music is stored on the TERRA-SERVER or can also be a hardware source like a CD player plugged on a TERRA-IEX. For the outputs an output only terminal like the TERRA-EX can be used or a TERRA-EXA if you need amplified outputs or you can also use the outputs of the TERRA-IEX & TERRA-FDX if you need outputs at the same place than inputs. The priority management is done by the TERRA-SERVER. Nowadays, there are no really limitations between Intercom & PABGM. 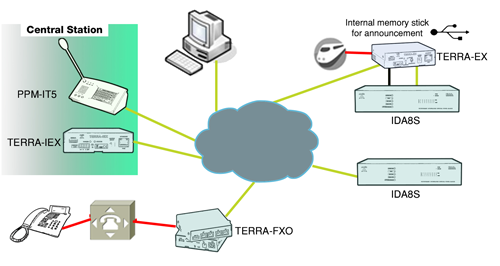 You can then decide to have a TERRA-SERVER or not, depending on the complexity of the system needs. Here an example without a Server. The background music will come from a hardware device like the processor UAPG2 plugged on a TERRA-IEX. Then the priority management is done by the TERRACOM devices themselves. The TERRACOM range with the IDA8 range offer a powerful solution for transport applications like subways, tramways... In each station, the IP matrix IDA8 will handle the streaming In case of used of another standard matrix, a TERRA-EX can deliver the decoded audio stream plus a serial link to control the matrix. 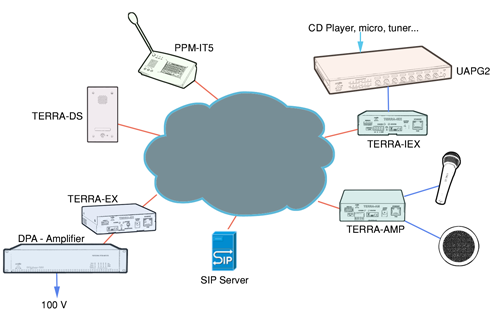 For backup reasons, you might need to link a traditional telephone system with the IP system thanks to the TERRA-FXO. With audio over IP solutions, you can now provide streaming audio over a standard Internet to any shops, restaurants and bars. Thanks to balanced outputs, IR for remote control and logical input for channel/volume selection, the TERRA-EX and the TERRA-EXA are a cost effective and professional solution. With the TERRACOM solution, you can go one step further: provide the right music and the right publicity everywhere you want. You can with this cost-effective solution easily adapt the advertising messages to each shop. The TERRA-EX will download the messages during the night, store them on the USB key and detect in the stream the moment when it should play them. This unique way of advertising management will give to your customer the impression that they are listening to your own playlist or radio station. The buffer size on the stream reception side has been increase to avoid Internet connection problems. In case of total loss of the Internet connection, the TERRA-EX will switch on the music stored in the USB memory key. This music can be refreshed during the night to change the backup play lists.